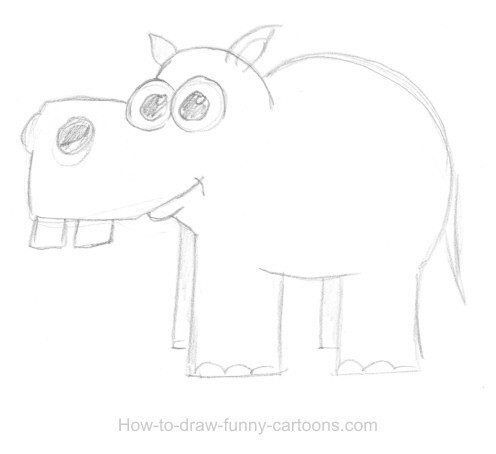 Learn how to draw a cute and funny hippo drawing! It's quite interesting to see that this cartoon animal is often drawn with a large smile, round body and adorable look while real hippos are usually serious and not too friendly. You can easily recognize a hippo with its large jaw, big nose and two big teeth. The bottom of the body is often similar to the one of an elephant. Let's draw a cute cartoon hippo with a subtle 3D effect. First, sketch your character on a piece of paper. Once again, I like to keep the cartoon character simple since the goal is to add great effects like shadows and reflections. 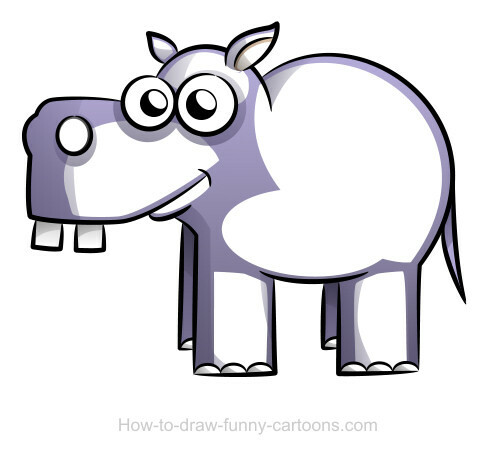 Convert your drawing into a digital template and add dark outlines on your canvas using a vector software. 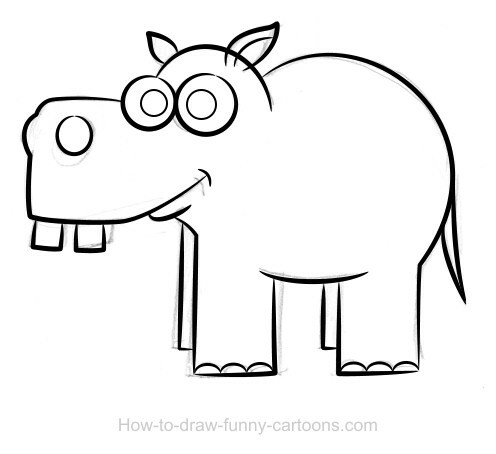 Once you are finished, you can delete the original drawing. Create a new layer and add plain shapes behind the original outlines. 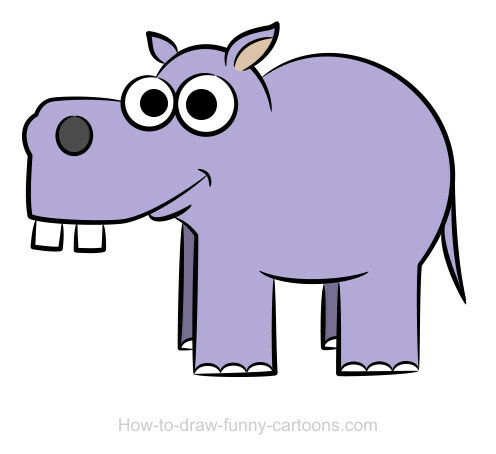 You can either choose a purple-like tone, or simply color your hippo in pink or grey. Make sure that legs on the far side are slightly darker. Use the gradient tool to create a simple basic shadow. For the legs on the back, the top part must be darker since the bottom of the body is hiding this area. To create darker shadows, we need to add another layer between the outlines and the shapes used to create colors. Presuming that the light is placed on top of the character (and slightly on the right), create your shadows accordingly. Use the transparency tool to partially hide the shapes created in the previous step. The cartoon character looks great, but it can be better with some nice reflections. To create these reflections, we need to add another layer of white shapes. These new elements must be directly aligned with the light source. These new shapes will add a lot of volume to our character. Once again, use the transparency tool to partially hide the bottom part of each shape. We want the shiny white portion to be visible on top of each part of the cartoon character.